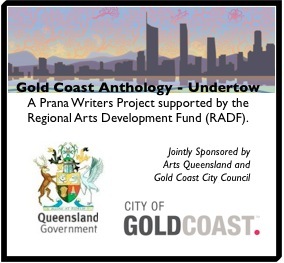 Back in 2011, a Prana Writers team won the National Open Section for Write-a-Book-in-a-Day (WABIAD). The book has been available for sale on Smashwords since. All process of sales go to the Royal Qld Children’s Hospital, so we thought we would give both WABIAD and our little volume a push, while we are spreading the word about the anthology. Thirteen year old sheep-shearer Jack’s dream of going to the Ekka seems doomed when a truck overturns on the highway, blocking traffic in both directions. 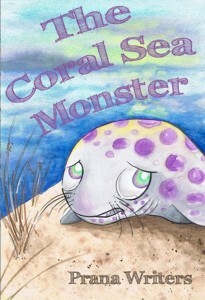 Just as he resigns himself to a boring day waiting for the tow-trucks, his brother’s car is rammed from behind, and so begins an adventure like no other to rescue The Coral Sea Monster. An Aussie adventure for nine to fourteen year olds. Write a Book in a Day (https://www.writeabookinaday.com/index.html) is a fabulous annual event. Write, edit, illustrate and bind a children’s book in 12 hours in a team of 5-10, and make a difference by raising funds to help sick children in your State’s children’s hospital. At school, home, book club, writing centre or office. Teams of writers come together to write a book in 12 hours. At 8am the team is emailed a location, main characters and words to include in a story. Books must be written, illustrated and bound within the 12 hour time limit. Teams can be school students or adults (in the open section). For the open section the book must be at least 8,000 words. I think Prana Writers produced 16,000 words in the end. Each chapter was written by a different writer, so we were really amazed that it sounded like it was the one voice. The physical books produced are given to the Children’s hospital of the team’s choice. Part of the deal with entering is the team must also fund raise for their chosen hospital. It really is a win-win for the children’s hospitals. Hats off to Chris and the volunteers at Write Book in a Day and their efforts to keep this running over the years.